"It arrived and was most beautiful. We had a memorial on Saturday for our beloved Sophie. She is now resting peacefully. I honor your Abbey for inspiring such a beautiful urn for my baby to rest in. 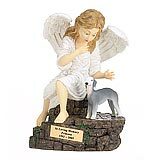 Thanks and though your success means people have lost their 4 legged children, the inevitable will happen, so I hope others find Angel Ashes too so their babies can have a beautiful place to rest. " 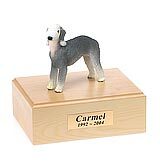 All available Bedlington Terrier dog urns and memorials will be displayed with the figurine on the Bedlington Terrier urn you select and in the appropriate size.